Does this happen in your neighborhood? Whenever it snows, we have four or five men who vie for the opportunity to exercise their masculinity by firing up their four wheelers, strapping on the ginormous shovel to the front, then riding them around the neighborhood shoveling all of the walks and driveways. I seriously think they spy on one another and then try to out do the other. For example, if, after (often during)the snow falls, the first one to don his parka and hood receives the honor of being the alpha shoveler, whilst the "losers" make a mental note of the time (5:30 am) to get up at 5:15 am to be first next time! I love it. I appreciate it. Even when the motors wake me up so early. It is an unbelievable act of brotherly kindness and service. After getting hit, the slats were strewn everywhere, the soil had spilled out onto the sidewalk, the poor post was leaning significantly and the whole thing looked like a pile of trash. And, wouldn't you know, before we could clean it up...MORE SNOW! Sooooo.....by the time it was revealed again after a slight melt, the soil was hard and difficult to move. Terry went on a hunt to find some rope. All we could find were yards and yards of bright blue cable wire!! Yes, he used it. So, what already looked "trashy" became even more mock-worthy trashy. It served the purpose though. What a mess. 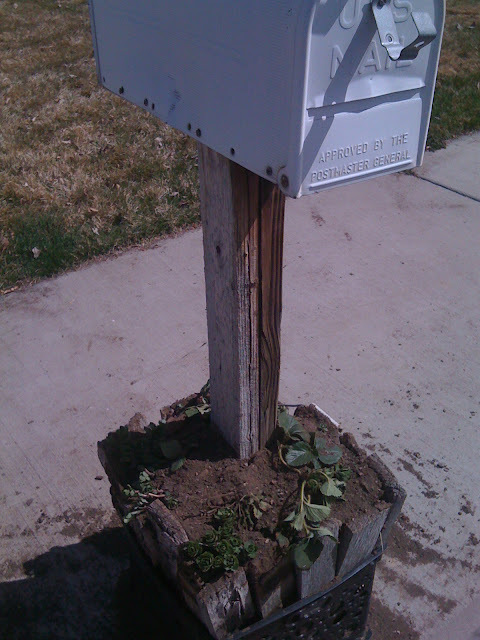 And to think that our poor mailcarrier who had to look at it every single day! 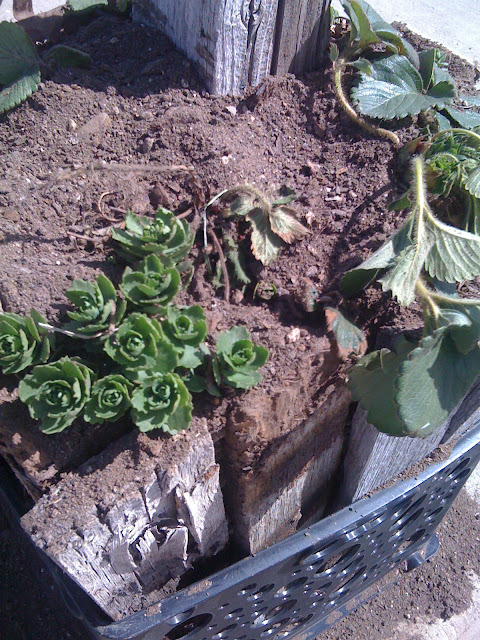 (Yes, those are transplanted strawberry and decorative plants! It made me giggle. Then it made me laugh right out loud. My boyfriend is the COOLEST. 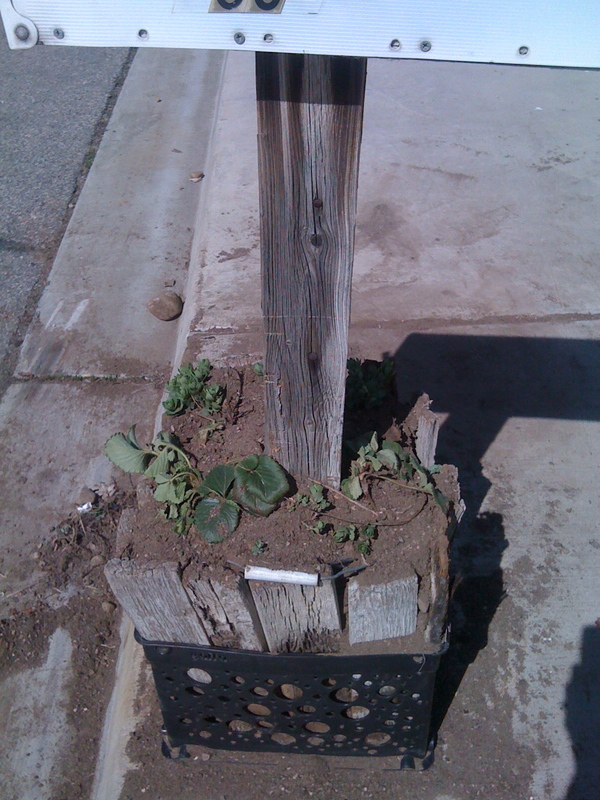 He is very, shall we say, "creative" in his home repairs. 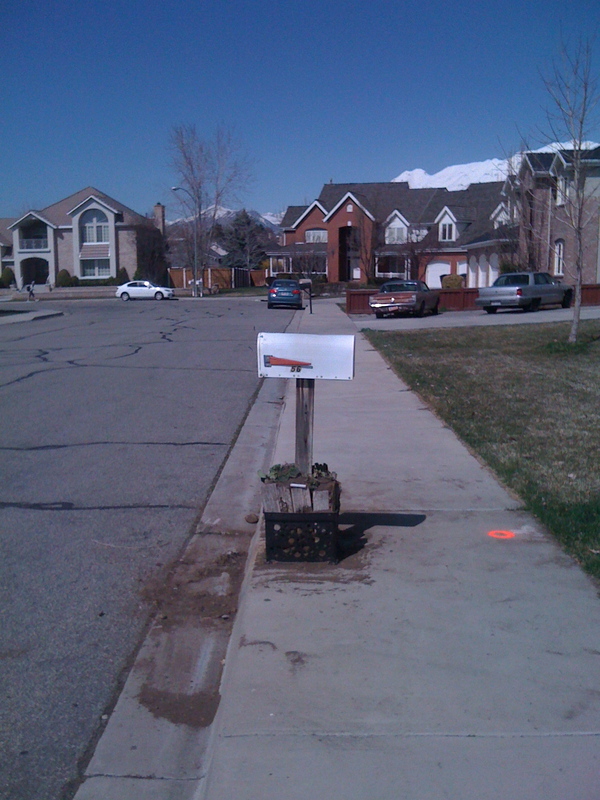 We are leaving it like this until our macho neighbor comes to drill a proper hole to rebuild us a descent mailbox. I love your boyfriends fix. It seems A LOT like something my own boyfriend would do. PS- Is it weird that seeing you have "Hen & Chickens" in your flower bed made me very happy? If so, oh well, let me be weird. Happy childhood memories with "hen & chickens". Oh I am giggling! The only thing you don't have that I would, is some duct tape. Somehow, there would be duct tape and a caulking gun used..... LOL! That is funny. I'm glad you wrote this post. It made my day!! !